This free scroll saw welcome sign pattern features an old car. Welcome Sign free building project. This freestanding welcome sign is a great beginner woodworker project. It is easy and this tutorial is a great way to get started. Greet your visitors with the colors of the fall. Pumpkins and leaves are the perfect motifs to decorate a welcome sign for your door. This free downloadable scroll saw pattern is for a beautiful welcome sign. Scroll down the page at the link to view the pattern. Free Scrollsawing Pattern – Welcome Heavy Haulers. This free downloadable scroll saw pattern is for a fun welcome sign. Scroll down the page at the link to view the pattern. Free Scrollsaw Pattern – Welcome. 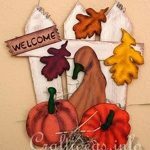 This free downloadable scroll saw pattern is for a Western Style Welcome Sign. Scroll down the page at the link to view the pattern. This free downloadable sheep dog welcome sign makes a great scroll saw pattern.